Are Fiberglass Pools Easier to Clean? "Are Fiberglass Pools Easier to Clean", well the short answer is "yes"; and the long ansswer is "absolutely fiberglass pools are the easiest pool to clean". When you are considering an inground pool and talking to pool contractors, the ability to clean the pool should be brought up when talking about inground pool prices. We are Talking to Inground Pool Builders, but I Forgot to Ask . . . When you are looking at inground pool prices many people often times forget to think about the weekly and monthly maintenance that is associated with the pool. How easy is the pool to clean? How much will I spend in chemicals? How much time will I need to spend on the pool each week? What is our Weekly Swimming Pool Maintenance? For this article we are just going to focus on the pool cleaning aspect of the pool. You are looking at different types of pools from your pool contractors, but at the end of the day you need to remember that you have to keep this pool clean. While a fiberglass pool cost may be more than other types of pools, it comes with a great little secret, "They Are Easy to Keep Clean"! The sides are easily wiped down as the pool is non-porous so the oils, dirt and "junk" can't be trapped. 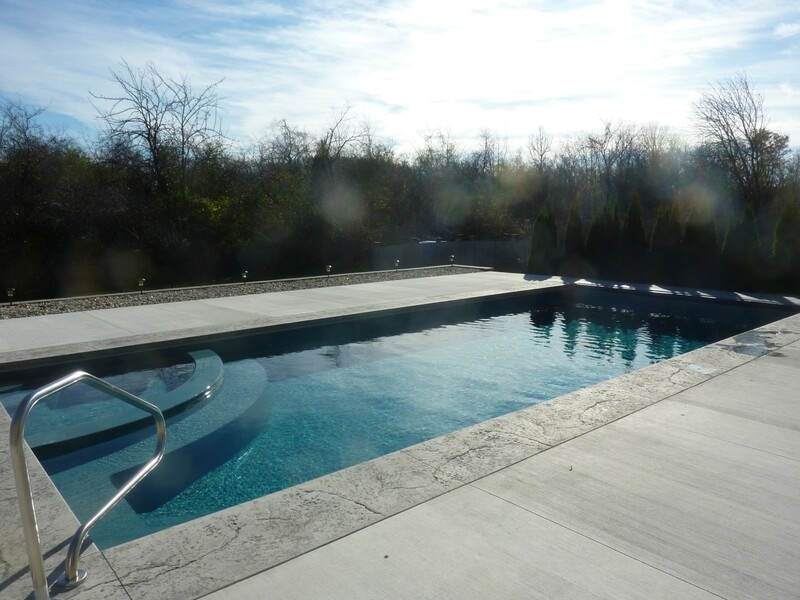 Unlike a concrete pool that will affect water chemistry, the fiberglass shell will not affect the chemistry of the pool allowing it to stay cleaner and require less manual cleaning. On average you will have to clean your pool 50% less than a concrete pool and about 25% less than a vinyl liner inground pool. If you do get a "scum ring" on your fiberglass pool is it more than likely for metals in the water or simply to many non-living organics in the pool. Oils, lotions, sweat from our bodies, dry skin . . . all those fun things you don't think about in your pool water can actually create a scum line. Good news is that if it doesn't just wipe up, you can use a simple enzyme product to get rid of it. Natural Chemistry's Pool Perfect Total is a great product to do just that. Regardless of the pool you have, Pool Perfect Total is recommended even if you don't have a scum line. Fiberglass pools are the easiest pools to clean, hands down. Inground pool builders who do swimming pool services know that their fiberglass pools require the least amount of cleaning. Fiberglass pool cost might be a little more, but you will save it in peace of mind and ease of cleaning your pool.